Arab rioters shoot fireworks and try to storm Temple Mount before being repulsed, in what looks to be 'day of rain' instead. Police were on high alert in Jerusalem on Friday, deploying 3,000 officers after Palestinian Authority (PA) Chairman Mahmoud Abbas's Fatah faction pledged a "day of rage" - but aside from a few incidents, it has been more of a "day of rain" in the wet capital after Jews changed to reciting the ten tal u'matar seasonal prayer for rain Thursday night. Not all Arab rioters took a rain check however, as several of them shot fireworks from rooftops adjacent to the Council Gate (Bab al-Majlis in Arabic) which leads to the Temple Mount. Several of the Arab rioters then tried to force their way through a police barricade at the Gate, where they were repulsed by police forces who used crowd dispersal means to break apart the violent crowd. 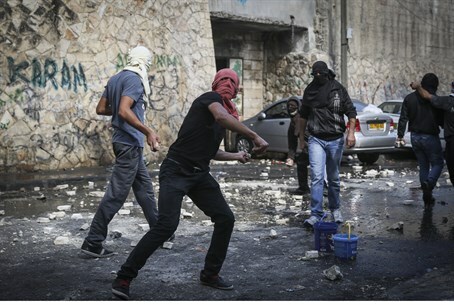 Then rioters launched a barrage of rocks on police and Border Patrol officers in nearby Wadi Joz neighborhood, where Arab assailants ambushed a Jewish car last night (Thursday). In the clash police used dispersal means, and no injuries were reported. The "rage" comes after Israel closed the Temple Mount to Jews and Muslims on Thursday, in an attempt to ease tensions after an Arab terrorist tried to assassinate Temple Mount activist Yehuda Glick in the capital. Reportedly Muslims were allowed on anyway, where they promptly rioted. Police folded to international pressure from America and Arab states on Thursday night, allowing Muslim men over 50 and all Muslim women access to the site on Friday despite the danger of riots that has turned into an epidemic at the site. Interior Security Minister Yitzhak Aharonovich (Yisrael Beytenu) traveled to the Temple Mount compound and Western Wall on Friday, where he was accompanied by police commanders to oversee the security precautions. Aharonovich has come in for a lot of criticism over the recent "silent intifada" in Jerusalem during his watch, although Jerusalem Councilman Arieh King on Sunday noted that the entire government is culpable - including Jerusalem Affairs Minister Naftali Bennett (Jewish Home), who he says has made no initiatives to deal with the threat.